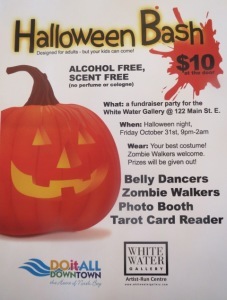 White Water Gallery is having a super spooky Halloween Party on October 31 from 9pm – 2am. The evening will feature a photo booth by Lindsay Sarazin, tarot card readings by Stephanie van Doleweerd, and a belly dancing performance by Fem Raqs, in addition to refreshments from the Opera Bakery Café, door prizes, haunting Halloween music, and much, much, more. Admission is $10 (does not include tarot readings or photo booth), so bring your best costume and come party with us!